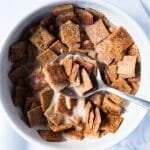 Gluten Free & Keto Cinnamon Toast Crunch Cereal 🥛 Now Extra Crunchy! 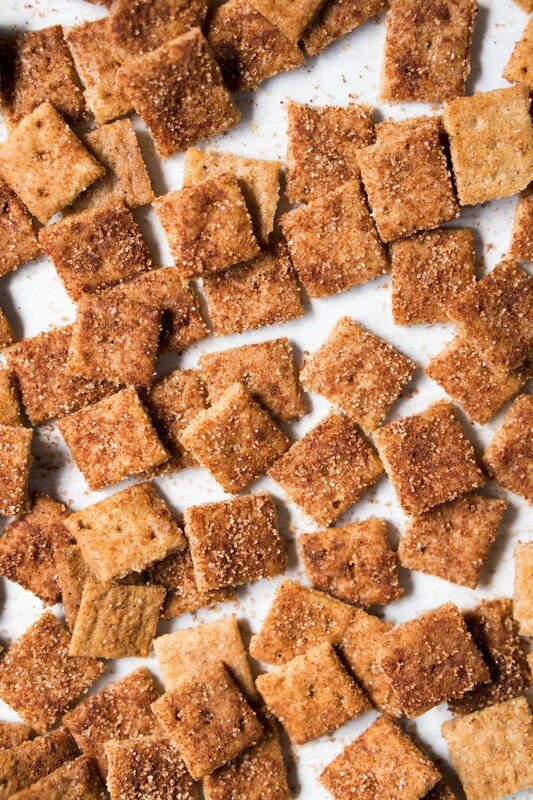 Our gluten free and keto cinnamon toast crunch just got a big makeover, making it much (muuuch!) crunchier. 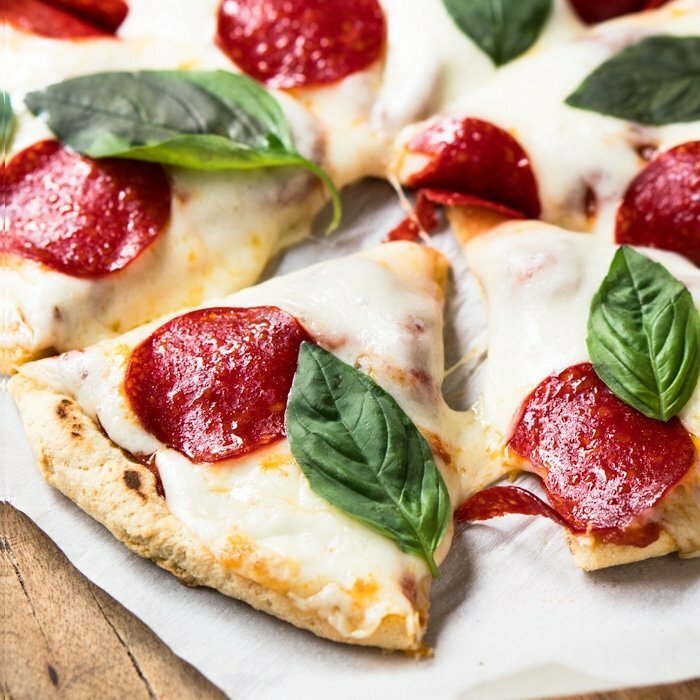 Plus less ingredients and just 2g net carbs a serving! 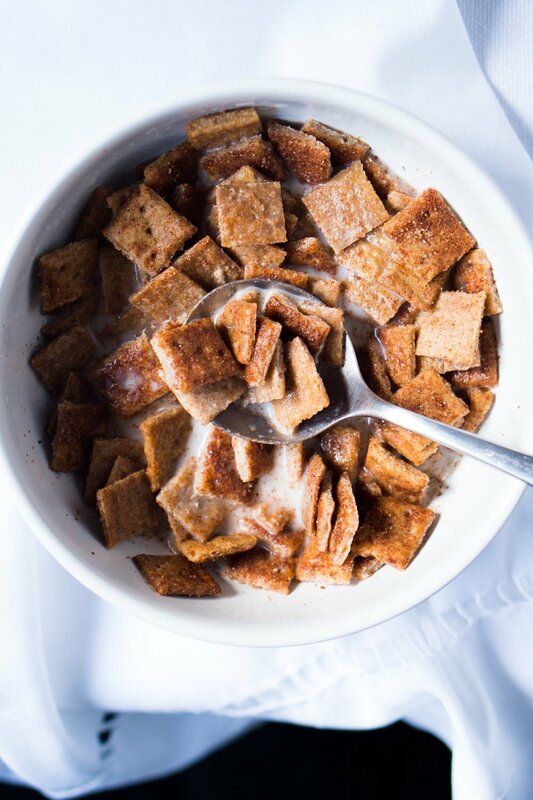 We’ve got grain free keto cinnamon toast crunch cereal, and we’re (most definitely!) sharing. Here’s your childhood’s cereal bowl dream, low carb and with all non-processed ingredients. And most definitely, one of our favorite sweet treats we’ve cooked up as of late. Who doesn’t remember getting home from school, and devouring a bowl of good-old cinnamon toast crunch with iced-cold milk. Or that late-night snack. That flavor will forever be engrained in our tastebuds. And since we’re in this woe for good, we thought we’d revive this classic for the sake of nostalgia. Though do note that the taste cannot be replicated exactly, blame it on artificial flavorings, refined sugars and processed carbohydrates. 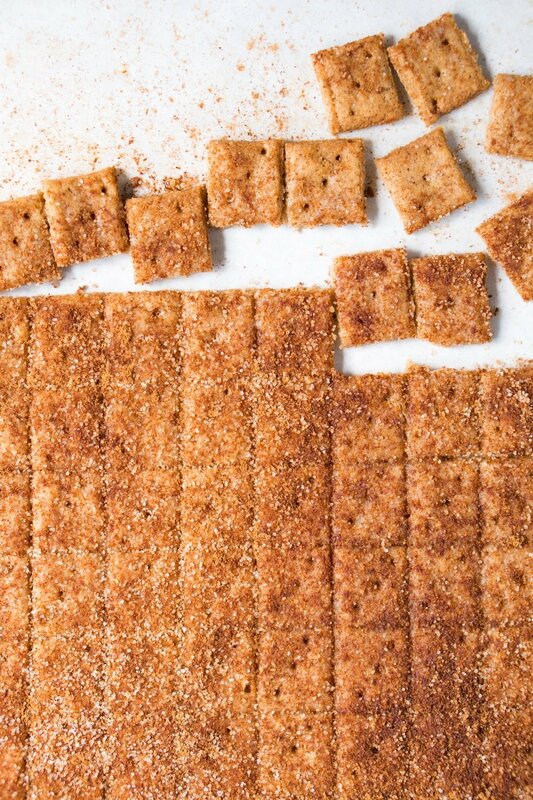 But trust us when we say that it will more than satisfy your cinnamon toast crunch cravings. And more. 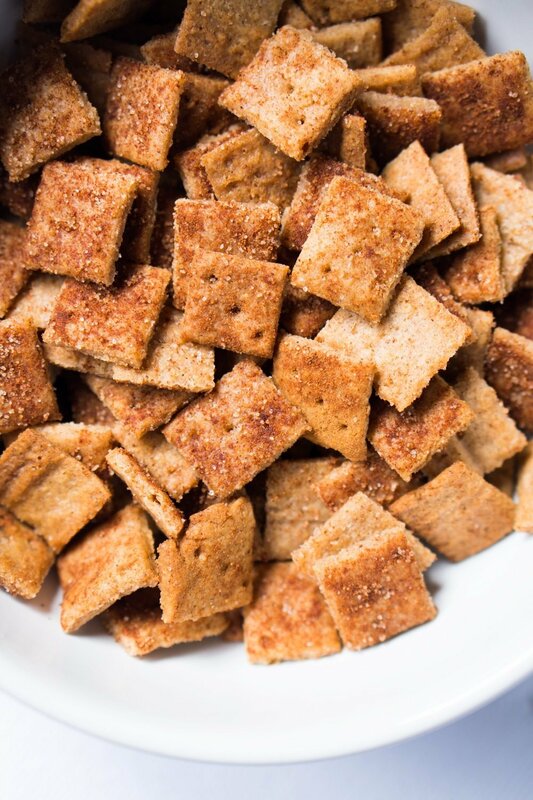 Keeping keto macros in mind, aside from making this classic cereal low carb, we made sure to up the fat in these keto cinnamon toast crunch. And we absolutely adore grass-fed butter as the fat here. Though do note that coconut butter can be subbed in, just note that the resulting cereal will be denser and therefore slightly less crunchy. So at 2g net carbs, we find these keto cinnamon toast crunch to be a very good deal. Particularly compared to the whooping 19g net carbs of the original! Essentially a cookies & milk sorta thing, it makes for one truly special keto breakfast treat. Creaming the butter properly with the sweeter is paramount here to build a nice structure for the cookies (think rise and crunch!). And creaming with sweetener, in case you haven’t done it before, takes a bit longer to incorporate than with good-old sugar. But don’t give up, and keep going until you’ve got the sweetener well incorporated into soft and fluffy butter. The other indispensable thing, is that the dough be thoroughly chilled before rolling and baking. Why? The butter in the dough has to solidify once again before you can roll it out and cut it up. Think 1 to 2 hours (or overnight). And if the dough becomes too sticky while rolling and cutting, just pop it in the freezer for a few (and a sprinkle of cocoa powder always helps too). We made this with both Ceylon cinnamon and Mexican cinnamon. And it’s probably no wonder (as it’s much less pricey), but Mexican cinnamon won all the way. Its sweet and strong aroma is key to get your cinnamon toast crunch right. Note: if your label doesn’t say Ceylon, it’s most likely the Mexican variety. So don’t sweat it. We found that super fine almond flour did a killer job (solo!). Add a touch of xanthan gum, and we’re golden. Erythritol lends a very similar crunch and chew to sugar for crisp cookies, and no other low carb natural sweetener does that (xylitol takes up to a day to crunch up and will result in chewy cereal!). My current favorite for these guys? Lakanto golden without a doubt. Least cooling effect, nice maple-like taste. But Swerve and Pyure (at half the amount) are awesome too. As for the ‘sugar’ cinnamon topping, you can either carry on with erythritol or use xylitol (with a preference for the later, as it has less of a cooling effect). This really depends how OCD you are. But please forget your pastry cutter or knife here. It’s all about the ruler. Wash up a ruler and use one of its edges to press down on the dough and cut it up. Then take a small fork and prick down each square to avoid excessive puffing. Totally worth it for the sake of a true bowl of keto cinnamon toast crunch. Oh, and if baking with cups rather than grams is your thing, just click on US Customary for an instant conversion. Add almond flour, cinnamon, xanthan gum, baking soda, and salt to a medium bowl. Whisk until thoroughly combined and set aside. Cream butter in a large bowl with an electric mixer, 2-3 minutes. Add in sweetener and continue to beat until thoroughly light and fluffy and much of the sweetener has dissolved. Add in egg, mixing until just incorporated. The mixture will appear slightly 'broken' (i.e. not thoroughly smooth). With your mixer on low, add in half of your flour mixture- mixing until just incorporated. Mix in the rest. Wrap cereal dough with cling film (saran wrap) and refrigerate for at least an hour and up to 3 days. Roll out the dough between two pieces of parchment paper until nice and thin. Using a ruler, cut dough lengthwise and then crosswise into squares. Prick each piece with a small fork (optional). 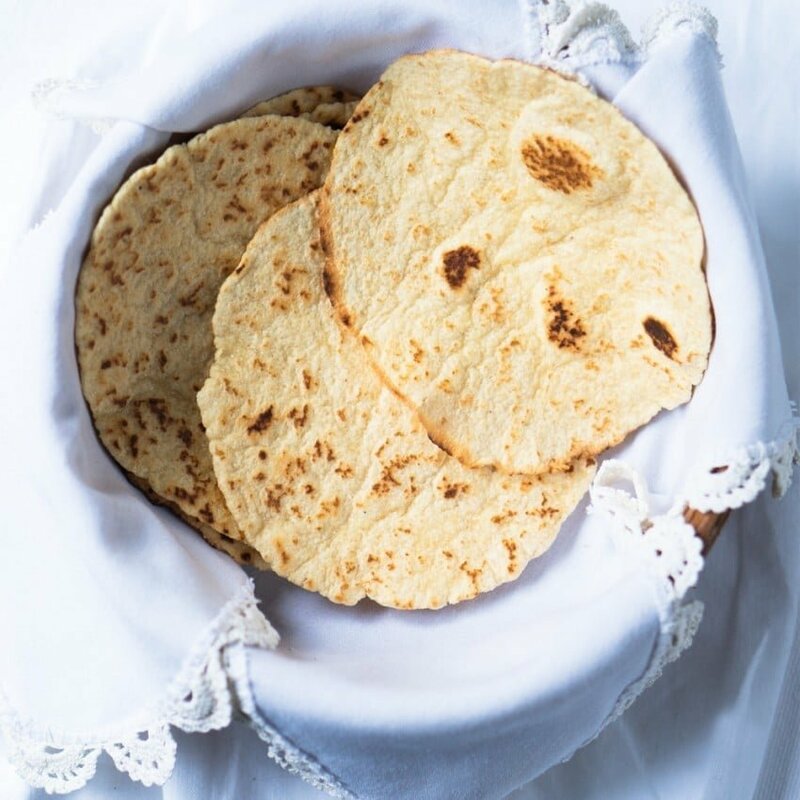 Transfer parchment paper with the keto cinnamon toast crunch to a baking sheet or tray, and place in the freezer for 10 minutes prior to baking. The shaped dough can be frozen for up to 3 months, and baked straight from the freezer (adding 2-3 minutes more to the baking time). Bake for 8-12 minutes, until fully golden (depending on size and thickness). Keep an eye out for them, and note that if you like them crisp you'll want to push the baking time as much as possible (until deep golden). Brush with melted butter and sprinkle with cinnamon 'sugar'. You can also do this prior to baking for a more 'crusty' result, both work well just depending on your preference so feel free to experiment. Allow to cool for ten minutes before transferring to a cooling rack. Allow to cool completely, as they'll continue to crunch up (this may take a few hours for the sweetener to harden up again!). *Coconut butter can be substituted if dairy free or paleo. Just note that your cereal will be less airy (and therefore crunchy). Having said that, still much crunchier than our previous version! Just made these and it turned out pretty good, with some adjustments. I didn’t have xathan Gum so I just used golden flaxseed meal. I also didn’t halve the amount of confectioners Swerve bc I like a really sweet cereal. I divided my dough into three parts, rolled them as thin as possible. First batch got burnt to a crisp at 350 degrees in my oven, so I decreased the temp to 300 for the last two batches. I found it easier to brush on the topping and cut them into squares while they were still hot out od the oven using a pizza cutter. They seem to be crisping up pretty good but I may dry them out more in my air fryer later at a low temp. Thanks for the recipe! I always miss cereal like crazy when I’m doing keto. What if I don’t have a hand mixer can I just use a whisker? Will it turn out the same? I tried using a whisk in similar recipe. It was a disaster. 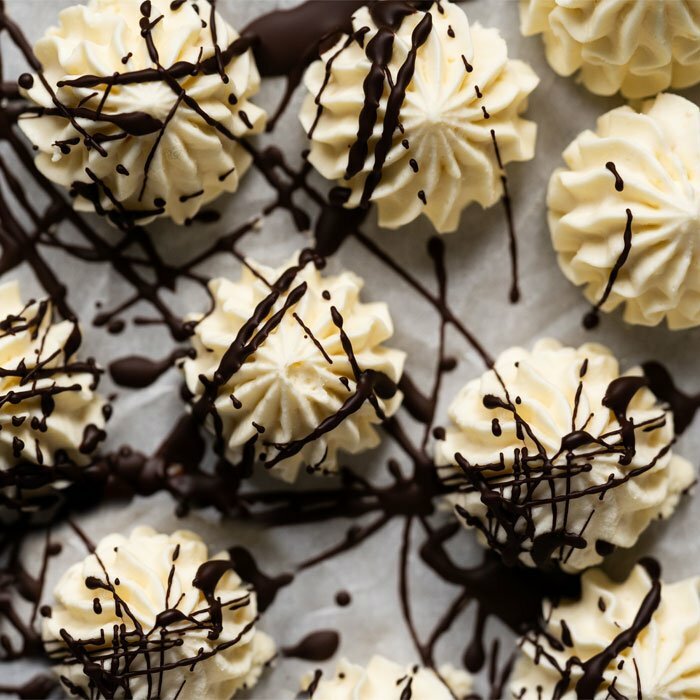 You’ll appreciate the power of a hand mixer. The flexibility of the loops in the whisk make it almost impossible. The hand mixer beaters are stronger. I was wondering if powdered or confectioners swerve will be ok? I don’t have the time, patience, or ingredients to make this! Can you just sell this???? Kidding, not kidding lol. The DOUGH is AMAZING!! If I ever stop eating that and get it into my fridge to harden I bet the cereal will be awesome! But the dough…mmmmmm!!! Je ne trouve pas le liens vidéo pour la recette.Merci. Hi Paola, I’m so excited to try this recipe! Do you think Sukrin Gold would work as well as the Lakanto Golden? I have Sukrin Gold around the house, but will order the Lakanto if it’s really that much better. Thank you! Thank you for this recipe! It turned out beautifully, just like you said. My only difficulty was, after fully cooling, then cutting, it would NOT crisp up….after many hours! What did the trick was putting it all back in the oven at 170 F for a few hours to dehydrate it. That worked fabulously!!! Can you use regular sugar if you are just gluten free (but not on a keto diet)? Thanks! Lots of healthy goodies are going to come my daughter’s way, thanks to your website. She has celiac, but gets some sugar treats on occasion, so we don’t need to cut back on the sugar. We made your quiche for her recital the other day – all 3 pies got gobbled up! Paola, you must be a saint with angel wings, Bless you..
What is the “flour” substance you use in the video to roll these out? Hello. Has the recipe video for the Cinnamon Toast Crunch been removed? I have searched & can’t seem to find it? Cinnamon toast crunch was my favourite as a child, and these taste very similar to them. I’ll admit I was skeptical that it would actually taste and look like cereal, but it does. They were all gone the night I made them..
1. I rolled out the dough, put in the freezer for 10 minutes and cut into squares prior to baking, but when it came out, I had to cut it again. Was my dough too thick? 2. Everything in the middle of the pan came out perfect, but the edges were burnt by the time the rest was ready. I baked on 180 c, should I try reducing the temperature the next time? And again, thanks for another amazing recipe! I tried your cocoa puffs as well and they came out literally perfect, so I’ll rate it too. Maybe I missed it, but I couldn’t find a video link. Looking forward to trying these! Is there a link to the video? My add blocker is turned off. wait so how long do i actually have to leave it in the freezer for? up to one hour and three days? what does “up to one hour and three days” mean? i leave it frozen for an hour and take it out for three days? what? You leave it in the fridge up to an hour. But if you won’t bake it that same day you have up to three days to leave it in the fridge. No it says for step 6 refrigerate it for no less than an hour and at max 3 days.